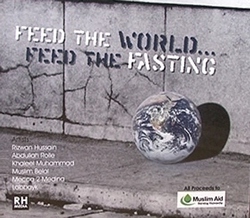 For the first time ever, Muslim Aid has released a new single ‘Feed the world, Feed the Fasting’ in collaboration with a host of famous artists from across the UK. Created by Rizwan Hussain (Channel S presenter), the track features renowned artists Abdullah Rolie, Muslim Belai, Khaleel Muhammad , Labbayk and Mecca2Medina. To get an exclusive copy, then please donate £10 to Muslim Aid, with all proceeds going to Muslim Aid projects around the world. To get a copy, call 020 7377 4200 or donate online.